An interesting case of possible plagiarism came up today as a YouTube video game reviewer has accused IGN of copying their review. Boomstick Gaming, which has over 17k subscribers on the platform, released a video this week (which you can watch below) comparing a review they had uploaded of the game Dead Cells to one posted by IGN Nintendo reviewer Filip Miucin. In the video, BG shows off his review on the right, followed by the official IGN review on the left. After watching it ourselves, we acknowledge that while it isn’t a copy-and-paste job, the similarity in word patterns and choice vocabulary make a pretty damning case that the content was copied. 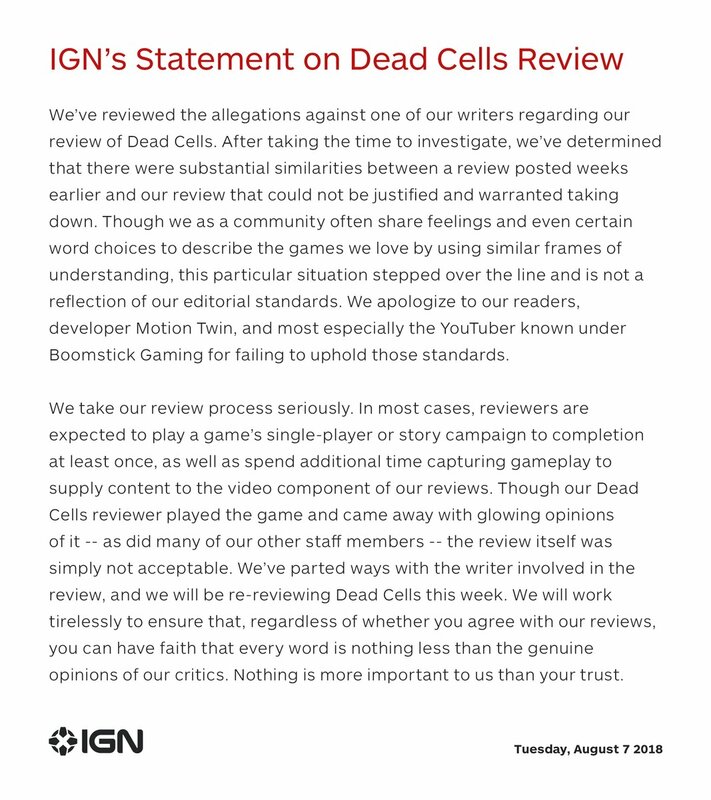 The review in question has been taken down by IGN, and the company posted an editor’s note explaining why. 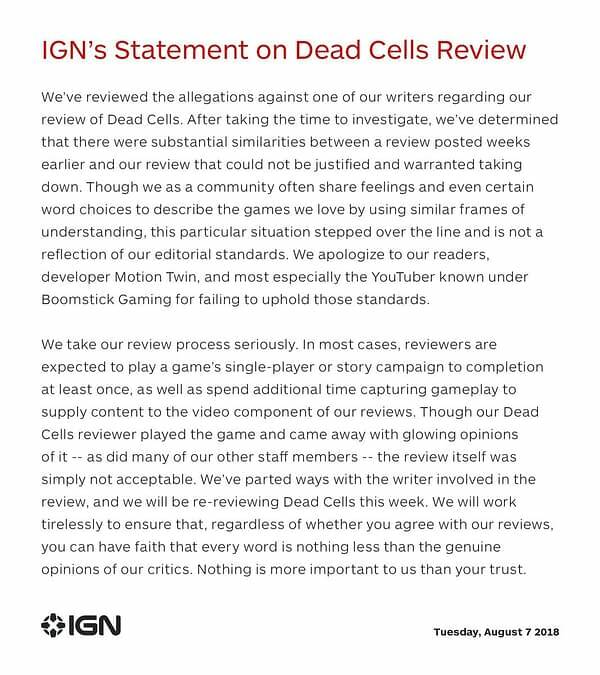 As a group of writers and creators who value our own work and that of others in our field, the editorial staff of IGN takes plagiarism very seriously. In light of concerns that have been raised about our Dead Cells review, we’ve removed it for the time being and are investigating. In our humble opinion, as writers who find stealing another writer’s work appalling, if IGN decides that Miucin did indeed plagiarize Boomstick Gaming’s review, they should offer Boomstick a job. If the review was good enough to be stolen and passed the editorial process before going on the site, then we say he’s good enough to be hired full-time and earning a check from the company. IGN has since parted ways with the writer in question and issued this statement. But we still stand by the idea that IGN should hire the reviewer at Boomstick Gaming, especially now that there’s a spot open.